Miyuki's long Magatama seed beads have a long petal shape and sparkle brilliantly with their colors! 10g (approx. Add layers of texture and color to your stringing projects with these beautiful glass beads! ). High quality Japanese seed beads from Toho. Suitable for jobs which need a regular sized seed bead. Round holed. Toho Code: 162C. Colour/Finish: Topaz AB. Size 15 beads are 1.5 mm in size. Size: 15/0 (1.5 mm). Strand of 20 topaz colour faceted glass drop beads. High quality Japanese seed beads from Toho. Suitable for jobs which need a regular sized seed bead. Round holed. Toho Code: 2CF. Colour/Finish: Frosted Topaz. Size 8 beads are 3.0 mm in size. Size: 8/0 (3.0 mm). High quality Japanese seed beads from Toho. Suitable for jobs which need a regular sized seed bead. Round holed. Toho Code: 162C. Colour/Finish: Topaz AB. Size 8 beads are 3.0 mm in size. Size: 8/0 (3.0 mm). High quality Japanese seed beads from Toho. Suitable for jobs which need a regular sized seed bead. Round holed. Toho Code: 2CF. Colour/Finish: Frosted Topaz. Size 15 beads are 1.5 mm in size. Size: 15/0 (1.5 mm). High quality Japanese seed beads from Toho. Suitable for jobs which need a regular sized seed bead. Round holed. Toho Code: 2. Colour/Finish: Light Colorado Topaz. Size 15 beads are 1.5 mm in size. High quality Japanese seed beads from Toho. Suitable for jobs which need a regular sized seed bead. Round holed. Toho Code: 177. Colour/Finish: Dark Topaz AB. Size 15 beads are 1.5 mm in size. Size: 15/0 (1.5 mm). High quality Japanese seed beads from Toho. Suitable for jobs which need a regular sized seed bead. Round holed. Toho Code: 162CF. Colour/Finish: Frosted Topaz AB. Size 8 beads are 3.0 mm in size. 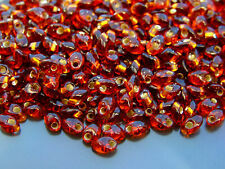 Transparent topaz brown TOHO Seed Beads. 10g is approx. Size: 4mm - ss16. These are high quality and shiny resin rhinestone gems which differ from Acrylics. The smaller sizes of resin rhinestones (2mm - 3mm) have 10 to 12 facets and the bigger sizes have 14 Facets (4mm - 8mm). High quality Japanese seed beads from Toho. Suitable for jobs which need a regular sized seed bead. Round holed. Toho Code: 162C. Colour/Finish: Topaz AB. Size 6 beads are 4.0 mm in size. Size: 6/0 (4.0 mm). Matte Transparent Dark Topaz 9134F. Miyuki Seed Beads 8/0. High quality Japanese seed beads from Toho. Suitable for jobs which need a regular sized seed bead. Round holed. Toho Code: 2C. Colour/Finish: Topaz. Size 8 beads are 3.0 mm in size. Size: 8/0 (3.0 mm). High quality Japanese seed beads from Toho. Suitable for jobs which need a regular sized seed bead. Round holed. Toho Code: 2CF. Colour/Finish: Frosted Topaz. Size 11 beads are 2.2 mm in size. Size: 11/0 (2.2 mm). High quality Japanese seed beads from Toho. Suitable for jobs which need a regular sized seed bead. Round holed. Toho Code: 2C. Colour/Finish: Topaz. Size 15 beads are 1.5 mm in size. Size: 15/0 (1.5 mm). Transparent-Rainbow Smokey Topaz TOHO Seed Beads. 10g is approx. Transparent-Rainbow Topaz Brown TOHO Seed Beads. 10g is approx. Transparent-Lustered Smokey Topaz Brown TOHO Seed Beads. 10g is approx. Transparent Smokey Topaz Brown TOHO Seed Beads. 10g is approx. 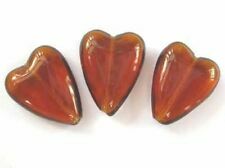 10 16x12mm topaz Czech glass heart beads. Imported from the Czech Republic. Beautiful beads to use in jewellery making. 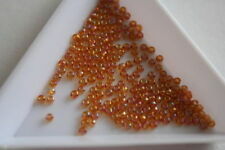 High quality Japanese seed beads from Toho. Suitable for jobs which need a regular sized seed bead. Round holed. Toho Code: 162CF. Colour/Finish: Frosted Topaz AB. Size 15 beads are 1.5 mm in size. Size: 6mm - ss29. 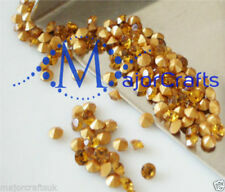 Point back glass crystals by MajorCrafts are ideal for making jewellery and other crafty projects. The crystals are non-hotfix therefore, you will need glue to affix them. Colour: Topaz Brown. 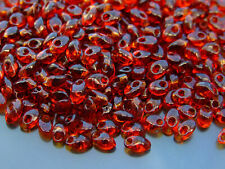 High quality Japanese seed beads from Toho. Suitable for jobs which need a regular sized seed bead. Round holed. Toho Code: 177F. Colour/Finish: Frosted Dark Topaz AB. Size 11 beads are 2.2 mm in size. High quality Japanese seed beads from Toho. Suitable for jobs which need a regular sized seed bead. Round holed. Toho Code: 162F. Colour/Finish: Frosted Light Colorado Topaz AB. Size 8 beads are 3.0 mm in size. High quality Japanese seed beads from Toho. Suitable for jobs which need a regular sized seed bead. Round holed. Toho Code: 177. Colour/Finish: Dark Topaz AB. Size 6 beads are 4.0 mm in size. Size: 6/0 (4.0 mm). High quality Japanese seed beads from Toho. Suitable for jobs which need a regular sized seed bead. Round holed. Toho Code: 177. Colour/Finish: Dark Topaz AB. Size 8 beads are 3.0 mm in size. Size: 8/0 (3.0 mm). High quality Japanese seed beads from Toho. Suitable for jobs which need a regular sized seed bead. Round holed. Toho Code: 2F. Colour/Finish: Frosted Light Colorado Topaz. Size 8 beads are 3.0 mm in size. High quality Japanese seed beads from Toho. Suitable for jobs which need a regular sized seed bead. Round holed. Toho Code: 177F. Colour/Finish: Frosted Dark Topaz AB. Size 8 beads are 3.0 mm in size. High quality Japanese seed beads from Toho. Suitable for jobs which need a regular sized seed bead. Round holed. Toho Code: 423. Colour/Finish: Dark Topaz. Size 8 beads are 3.0 mm in size. Size: 8/0 (3.0 mm). Our premimum diamante crystals have a precision cut. The higher the number of facets the shinier the diamante will be. Size: 6mm - ss30. Material: Glass Crystals (DMC A Quality). Colour: Smoked Topaz Brown. Our premimum diamante crystals have a precision cut. The higher the number of facets the shinier the diamante will be. Size: 6mm - ss30. Material: Glass Crystals (DMC A Quality). If you are looking for premium quality rhinestones at value price, then these rhinestones are for you. High quality Japanese seed beads from Toho. Suitable for jobs which need a regular sized seed bead. Round holed. Toho Code: 2C. Colour/Finish: Topaz. Size 11 beads are 2.2 mm in size. Size: 11/0 (2.2 mm). High quality Japanese seed beads from Toho. Suitable for jobs which need a regular sized seed bead. Round holed. Toho Code: 162C. Colour/Finish: Topaz AB. Size 11 beads are 2.2 mm in size. Size: 11/0 (2.2 mm). Create bold jewellery and craft projects using these popular size 15/0 Miyuki seed beads. These dark topaz glass rocailles will look lovely as part of an ethnic inspired stitched bracelet cuff, paired with our range of gold beads and findings.